Posted by dutchgrub	on Wednesday, January 21, 2009 at 22:38. 0 Comments. On Sunday I gave you some ideas on where to watch Obama’s inauguration in Amsterdam. As planned, we headed to the “Yes, We Watch” party at Felix Meritis on Keizersgracht. And we had great fun! We got there at 17:15. 45 minutes before Obama would take his oath and plenty early. Or so we thought! Felix Meritis was packed already. Outside, it was hard to find a space for the bikes. 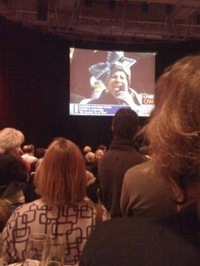 Inside, there was standing room only by the big screen. And it took me a good ten minutes to order beers. There was much anticipation and the crowd was rather rowdy – at least for such a ceremonial event. There were boos when George W. entered and loud cheers when Obama arrived. An early highlight was Aretha Franklin – legendary also in Amsterdam’s literary circles. 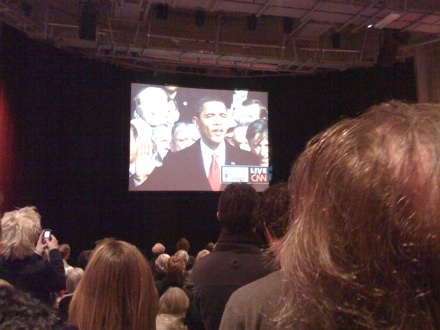 Obama raising his hand to take the oath provoked a collective roar by the large crowd, which then attentively followed his speech.